ACE PRODUCER/HIP HOP ARTIST, XBLAZE RELEASES NEW SINGLE - "VORTEX"
Highly talented producer and hip-hop artist, Xblaze releases his new single - VORTEX - a song with a swirling mass of feeling and musical depths, showcasing the whole essence of the man called XBLAZE. Self-Produced with his Soul searching vibes, smooth lyrics and tunes, "VORTEX" is song created to simply express Xblaze's state of mind, a place that everyone can easily connect with, as we all thrive daily to achieve our dreams and goals. This song is surely bound to be a favourite with HipHop lovers. Feel his music, Feel his passion..Get into his VORTEX. Long time ago, in the galaxy of Nigeria, a child was born to bring back... the true sound of HipHop and he was called XBLAZE (oh well, after his parents officially named him Adebosoye Laoye, that is). Yeah, he's the younger brother of none other than the exceptional singer/performer, Nikki Laoye. Having a sister like Nikki gives you a deeper insight to the musical genius you are reading about at this very moment. Born on October 6th, 1986, Xblaze was a unique child while growing up, always creating anything out of everything and simply loved to play with words. He grew up listening to hiphop heads like PeteRock, Gangstar, Trybe called Quest e.t.c in the early 90's and in 2004, he veered into music production out of curiousity as he'd developed such a great ear for notes and sounds. With the use of a friend's studio, he taught himself the basics of music production and now with constant online research, endless development of his skills and a passion beyond measure, here emerges one of the most unique music producers from these part of the world. 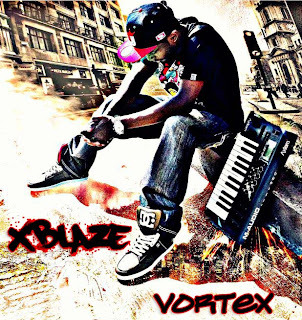 Xblaze presently runs his own studio and production outfit called Rocsteady86 Productions and has worked with a number of top artistes including ModeNine (produced "Muzik Lives" - on the album- DaVinci Mode); his sister, Nikki Laoye; Female Em-Cee, Blaise; Base One; HipHop artistes from USA - Verb, M.Simile, who sought him out after hearing some of his productions on the internet. A Part of the Wahala Media Entertainment Family, Xblaze daily exhibits his amazing mastery of beat production, vocal mixes and music mastering and also loves to express his lyrical side as a hiphop artist as well. He presently has singles such as "Born to Spit", "Luv for the Game", "Omega X", "Boom Bap" , which had been released online over a period of time and now he brings to you his latest effort, VORTEX.